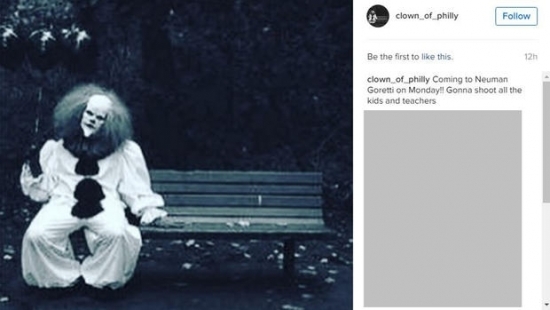 Police have now arrested two Washington Township teens in relation to the clown threats that were targeting Washington Township schools in New Jersey. The suspects have been identified as a 13-year-old girl, and a 14-year-old boy both from Washington Township. The 13-year-old girl had posted threats online that identified many victims by name, address, and other personal information. She has been charged with cyber harassment in the fourth degree. The 14-year-old boy posted similar threats online, only his were a geared toward the general public. So far no charges have been filed in his case. Earlier on Monday police arrested another 13-year-old girl who had posted a similar message on social media threatening Philadelphia Schools. Philadelphia Police unveiled a new cruiser that will be an eco friendly plug-in hybrid. The cruiser is part of city wide effort to become more green. The new Ford Fusion Energi police cruisers will be able to travel 22 miles before it turns to the gasoline tank. A charging station for the cruisers has been installed at the 6th District in Chinatown, more of the stations will be added once places are found. As of now 4 of them will soon be added to the fleet, and 17 more are expected to come in January. New Jersey Police say that a woman stole an EMT's wallet on Saturday after her boyfriend had just been struck and killed by a car on Mullica Hill Road. 25-year-old Brittany Carulli was riding in the ambulance on the way to the hospital when the wallet was stolen. The medic contacted the police later that day after realizing her wallet was stolen from her purse that was in the center area of the ambulance. Police arrested Carulli after she admitted to stealing the wallet. The wallet was returned to EMT, but $120 were missing from the wallet. Today, Mostly Cloudy, with a high of 70 degrees in Center City.